The history of EV (Electric Vehicle) in Kathmandu, Nepal is 37 years old. In those days the vehicles were in limited numbers. There were very old vehicles which was not emission free. Vehicles like Volkswagen Bettle, Volkswagen Camper, Bajaj Tempo and other were in use at that time. But now the automobile market in Nepal is increasing quickly. There are lots of vehicles in the Streets of Kathmandu. This increased number of diesel and petrol vehicle has raised a major problem including congested roads, traffic jams, road accidents, air pollution and so on. These kinds of problems can be reduced by use of zero emission vehicles. In context of Kathmandu, EVs are the most suitable means of transportation as they are pollution free, small and speed restricted. 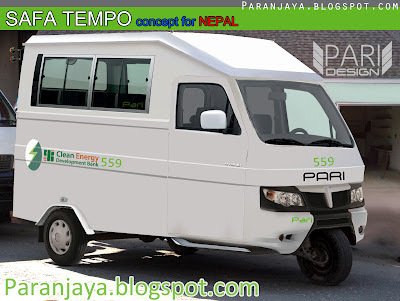 In 1975 Chinese government introduced 13km route between Tripureshowr and Surya Binayak by Trolley Bus system which was later closed in 2001.In 1996 a team of Nepali professionals and entrepreneurs bought the 7 EVs and started the former EV Company(Nepal Electric Vehicle Company) in Kathmandu. This was the beginning of the EVs in Nepal. Manufacturing of SAFA tempos increased when the GON (Government Of Nepal) declared to stop the operation of diesel-operated 3-wheelers from Kathmandu because they caused a lot of air pollution. In effect, a huge number of diesel powered 3wheelers were transformed into the EVs (SAFA tempos). Now there are more than 600 Tempos operated throughout out the city. To charge them, 37+ Charging Stations are sited. EVCO and other 4 manufacturers are involved to build it. · Promotes the use of clean energy (hydro-electricity) thus reduces the use of fossil fuel. · Uses off peak hour electricity since battery are charged during nights. · Local industry - creates employment for local people. · Revenue source for government from the sale of electricity. The chassis of the SAFA can withstand the weight of 12 people along with one set of batteries. The gross weight of SAFA tempo is 1000kg. Two sets of batteries are required for the commercial operation of EVs. A battery charging and exchange stations is also required along the route. In the future we can expect to see expansion of the trolley bus system, new types of EVs and improved batteries, provided that the government supports the development of this industry. An NGO named Himalayan Light Foundation (HLF) in collaboration with Lotus Energy has recently modified a milk float from the UK to make a new electric-bus. According to the manufacturers, the electro-bus has a capacity to carry 18-22 passengers (2500kg) and runs on a 72 volt dc heavy duty deep cycle battery comprised of 36 pieces of 2 volt cells. The electro-bus has a 600-amp sepex controller (much bigger than safa tempo) and this allows for regenerative braking (which means the motor becomes a generator when the brakes are applied). The motor is a locally re-fabricated morris motor of approximately 18-horse power. The vehicles can go at a speed of approximately 45 km/hr but reaches this speed faster than a Safa Tempo. Currently HLF has manufactured one Electro Bus, and plans to make three more if the government allows them to do so. Although the Electro Bus has been ready for more than six months, the government has not yet given permission to HLF to operate the Electro-Bus on a trial basis. A private company has also initiated the process of importing electric cars called "Reva" from India. According to manufacturers, the car has a range of 80 km (fully loaded) per charge and has a running cost of Rs. 1 per km. The cars are currently stuck at the customs due to lack of government support. In the future, there are also possibilities for introducing electric motorcycles and cycles in Kathmandu. Hybrid vehicles (both diesel/petrol and electricity operated) are also possibilities in the future. With improvements vehicle and battery technologies, it is expected that electric vehicles will be cheaper and more popular in the future. Yes definitely zero emission vehicles are good for the environment. Lesser pollution means it is better for the environment and also for the people! You can also check out the electric version of Mahindra Maxximo passenger vehicle. Its really good! Electric vehicles are getting popular in many countries. Nice to know about it.I appreciate the worth of this company.So nicely designed it.Its very useful for carrying the load also.Nice work done on the blog.I like this so much.If you want to know more about the cars and their specifications so haven a look on bmw vin decoder full.It helps you a lot.